We've all had it, I'm sure: that feeling, when reading something, that we've read this before. Sometimes it's a case that the reader has re-discovered a work that he or she initially read many years earlier and had forgotten; sometimes it's an author taking a theme or plot or situation that another writer first thought of and turning it into something new. Authors occasionally do this with their own works: for example, Arthur Conan Doyle used the central plot device of 'The Red-Headed League' three times, in the initial story and later in 'The Stockbroker's Clerk' and 'The Three Garridebs'; M. R. James re-used the plot of 'The Mezzotint' in 'The Haunted Doll's-House'; and Agatha Christie utilised the same setting and basic characters in the novel Evil Under the Sun and the short story 'Triangle at Rhodes', albeit bringing each work to a very different conclusion. The ghost story world is full of examples of authors who use the work of earlier writers to work their own variations on a theme. H. R. Wakefield's 'He Cometh and He Passeth By!' is an obvious nod to James's 'Casting the Runes'; Frank Belknap Long's 'Second Night Out' is Marion Crawford's 'The Upper Berth' all over again; L. T. C. Rolt admitted that his tale 'New Corner' was inspired by Wakefield's 'The Seventeenth Hole at Duncaster'; Edmund Crispin's 'St. Bartholomew's Eve' is James's 'Count Magnus' in another guise (the story also inspired Wakefield's 'The Sepulchre of Jasper Saracen'); E. F. Benson's 'The Bus Conductor' is a spin on Rose Champion de Crespigny's 'The Shears of Atropos' (which itself is based on a well-known 'true' tale told by Lord Dufferin); while Benson (with 'The Step') and Ruskin Bond ('A Face in the Night') are clearly borrowing from Lafcadio Hearn's 'Mujina'. This leads us to slightly murkier waters. While in all these cases the later writer is clearly riffing off an earlier tale, and making no apologies for it, each author has managed to take the original work and infuse it with something new, something which makes the new story at once a recognisable tribute to an earlier work but something which stands on its own as a fine tale, without ever tipping over into plagiarism. Less clear-cut is another adaptation of Hearn's 'Mujina', which I first encountered in a book aimed at younger readers by Bernhardt J. Hurwood. Chilling Ghost Stories (1973) was presented as a collection of new stories, but one of the tales, 'The Thing', is clearly an unacknowledged swipe of Hearn's tale. And imagine my surprise when I first read Arthur Gray's Tedious Brief Tales of Granta and Gramarye and realised that although I had never, to the best of my knowledge, read any of Gray's stories, three of them were familiar. A little thought and a brief hunt through the bookshelves supplied the answer. 50 Great Horror Stories, edited by John Canning, purports to be a collection of tales which, according to the introduction, 'have in common the fact that they are either true, have been recorded in contemporary documents as fact, or have become such a prevailing folk myth as to suggest some evidence of actual occurrence'. However, three of the stories—all as by J. Wentworth Day—are retellings of tales written by Gray for Tedious Brief Tales. 'Sung to His Death by Dead Men' is a retelling of Gray's 'The True History of Anthony Fryar'; 'The Dead Killed Him In His Own Grave' is based on 'Thankfull Thomas'; and 'The Man Who Turned Into a Cat' is 'The Necromancer'. In all three cases Day introduces the story in the context of the present day and then gives us Gray's original, more or less verbatim, with no acknowledgement anywhere in the book that he has done so. I've encountered this same situation three times in my reading of stories submitted to All Hallows: works which are not merely tributes, or homages, or nods towards the work of another, but which are plagiarism, pure and simple, in which the author has tried to pass off the work of another as his own. The first such instance I recall was a tale concerning a man who has the ability, when walking through a cemetery, of looking at the tombstones and seeing written there, beside or beneath the pious sentiments and uplifting remarks concerning the deceased, comments which more accurately—if angrily—reflect the true nature of whoever is buried there. When the man comes to the tombstone marking the grave of his recently deceased love, he reads 'She was cuckolding her fiancé and going to meet her lover when she caught a chill and died'. This is, of course, Guy de Maupassant's 'Was It a Dream? '; it had been rewritten in slightly more contemporary language, and re-set in America, but apart from that there were no changes to the original. The second instance was a story concerning a man who goes to check over a holiday cottage he's thinking of renting, and encounters mysterious goings-on concerning a snowstorm, a surprise visitor, a car in the garage, a dead body, and a disappearing woman. I hadn't read very far before realising that it was A. J. Alan's 'My Adventure in Norfolk', again re-set in America and updated language-wise, but with none of the charm or humour of Alan's original. The third was a story concerning a man whose ancestral home is haunted by a weeping lady, who appears once a year and cannot be got rid of, until the homeowner hits on the plan of luring her outside into the freezing night, where she turns to ice, after which time she is stored in a refrigerated warehouse for all eternity. 'Ah,' you are all saying, 'it's John Kendrick Bangs's "The Water Ghost of Harrowby Hall" all over again.' Yes, indeed it is, but as with the Alan, without any of Bangs's humour; and once more, the story has been re-set in America. I sense a trend here. In all three cases I wrote back to the author in question—none of whom were known to me—politely pointing out that the stories they had sent in were plagiarisms of quite famous stories. In no case did I receive a reply, which is hardly surprising: what on earth could the author say? But it would have been interesting to get a response, and find out why on earth someone would try something like this. It also makes me wonder if any of the authors tried submitting their stories to more general markets, where the editors were less likely to spot the similarities with the original works. The bottom line is that there's a very fine divide between homage and plagiarism, and the wary editor has to be on guard. By all means, look to the work of past writers for ideas and inspiration; but when you sit down to write, it's probably best not to have the original work at your elbow as you type. You'll find them, I imagine, at auctions and flea markets and in consignment and charity shops: boxes of assorted goods, inexpensively priced, the contents a jumble of items which often have no clear relationship to each other. A silver spoon, a ceramic ornament, a set of coasters, wooden bookends, a pair of candlesticks, a paperweight: all of these things, at some time, meant something to a person who no longer wants or needs them or, more sadly, is no longer here to care what happens to items collected over a lifetime. What a wealth of information they could provide about someone who no longer has a voice; and what a wealth of information is lost because these items no longer have any meaning except as objects in and of themselves. This morning Tim found a box of delights in the garage, while he was helping Christopher try to make some sense of a bank of shelves on which is stored files relating to our various publications, and multiple dustjackets for almost every book we've published. He proudly carried the box upstairs, and I opened it, and as I pulled each half-forgotten item out of its depths memories were stirred which began clamouring like eager children, each one trying to push to the front, and for a moment all I could do was stand still and let them wash over me before I tried to sort through them. Here is a silver crown piece from 1890, displayed in a brass stand, and suddenly it is 1983 and I am standing in a tiny shop on Pulteney Bridge in Bath, hoping that I can find one from that magical Sherlockian year of 1895 but deciding that 1890 is close enough. On one side—which I find is called the obverse—is the head of an older Queen Victoria, and on the other—the reverse—is St George slaying the dragon (the coin depicted her e isn't mine, but is a lovely view of the design). I have no idea what the coin is now worth, or even what I paid for it; I was simply enchanted with the idea, at age nineteen, of owning my very own crown, a coin which Sherlock Holmes himself might have handled. It probably has a certain monetary value, but to me the value is in the association: with Sherlock Holmes and that magical world of Victorian London, with that wonderful trip to England so many years ago, with the knowledge that it has passed through the hands of so many people. the majesty, the history, the beauty of that place? I, a seventeen-year-old from the west coast of Canada, had never in my life seen, or even imagined, anything like the Tower, and I wandered through it for as long as I dared before dashing to the gift shop, scooping up as many books and pamphlets as I could find, and running for the coach waiting to whisk us off to the next stop. That summer I painstakingly compiled a handwritten book about the Tower, culling information from my booklets, and drawing maps and plans and even a word search puzzle, which were carefully glued in place; and even now, so many years later, this fascination with the Tower remains, so that in any film set in London which shows the river around Tower Bridge I am scanning the edges of the shot, looking for the Tower, as anxious that it should still be there as those who clip the wings of the ravens who inhabit its grounds, lest the birds leave and the Tower, and the monarchy, fall. I plunge in my hand, and out comes a shell, which I know is a cowrie, and with it comes a picture, vivid as if he were standing before me, of my maternal grandfather, John Grant. He and my grandmother used to vacation in Hawaii, on the island of Kauai, for several weeks each winter, and Grandpa would collect cowries from the rocks off the beach near where they stayed, and bury them in the garden, to be collected the following winter. It is a beautiful thing, smooth and sleek, black and brown and cream, and I remember our trip to Kauai in 1978, but most of all I remember Grandpa, his moustache tickling as he kissed me, the little song he would sing when, as a child, I stayed with him and Grandma at their house on Skaha Lake in the Okanagan Valley and we would watch the wind whip the lake: 'Every little wave has its white cap on'. From Grandpa Grant I inherited my love of the Old Country, of history, of tradition, and I miss him still, and wish he could have known Tim. And this leads me on to thoughts of his widow, Glenna Grant, my grandmother, who died two months ago, a week before her 99th birthday, and I remember a picture of her and Grandpa, taken on their wedding day, Grandma looking shy yet lovely, Grandpa pleased and proud, both of them impossibly young to me, who knew them only when they were already well into their fifties. And I look at the letter opener in the holder on the desk in front of me, with its leather handled embossed with the letters 'J. J. G.'—John Jenkins Grant—in Gothic script, and I think that Grandpa would be pleased to know that it is still being used. Another paperweight, this one with a detail from J. M. W. Turner's 'The Fighting Temeraire'. A print of this painting hangs downstairs, and although the colours in the paperweight—like those of Holler's view of the Tower—are faded, they still retain a sense of Turner's vibrant colour. 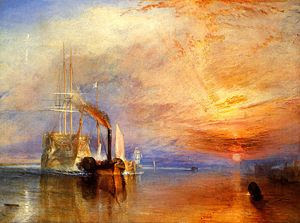 I first encountered the painting—a different detail of it—on the copy of my Penguin Classics edition of Wilkie Collins's The Moonstone, and purchased the print and had it framed on the strength of this acquaintance; yet nothing could prepare me for the shock of seeing it—Turner's actual painting—in the National Gallery in London in 1983. I had known its reproduction, its echo, for so long that seeing it in front of me in all its glory, knowing that Turner himself had touched that canvas, being able to drink it in as the artist had intended, was a revelation. Art became, at one leap, something alive and vital, passionate and dangerous, something that could touch the heart and soul. And now—but what's this? A slice of something, a rock—no, a slice of brick, yellowed and pitted, and suddenly I am in the churchyard in Lucan, Ontario, for this is a slice of brick from the church where the Black Donnellys are buried, and of a sudden it is a hot late summer day in southern Ontario and I have asked my Uncle George if we can visit Lucan, so that I may see the scene of those terrible events of 1880, when members of the Donnelly clan were murdered by townsfolk who, guided either by righteous indignation or a thirst for blood—depending on whose version of events you choose to accept—sought redress for wrongs either real or imagined; at this distance it is hard to know whose story to believe. I had read two books on the subject, and wanted to see the scene for myself; perhaps I felt that if I visited Lucan I would know on which side the truth lay, but at that remove it was almost impossible to imagine such bloody vengeance in such a peaceful spot. The grave was there, though, as proof that it had happened, and a pile of discarded bricks beside the church demonstrated that life continues: the old must make way for the new, and perhaps it is best that this is so. But I took a brick from the pile, perhaps to ensure that the old was not forgotten, and Uncle George carved a piece from the end of it for me, and there it is, mute testimony to a tragedy. A crudely carved wooden horse is next; and now we are closer to home than England or Kauai or Ontario, for on the base is written 'Souvenir, Cornwall Lookout'. The name will mean nothing to most people; yet Cornwall Mountain is something which I see every day from the front of our house, and while I cannot see the Lookout from where we live, I can see the cut in the mountain just below it, which as I write is filled with snow, despite the warm temperatures which make us think that Spring is now something more than an abstract concept. The horse was carved by someone who worked at the Lookout, when it was a forestry station manned every summer; the station is, as far as I know, still there, but is now only manned when conditions warrant it, which means that the road leading to the top of Cornwall—treacherous at the best of times, narrow and rutted and rocky—is no longer maintained, and has retreated into something wild, to be attempted only by the hardiest of souls. The view from the top, however, more than repays the trouble of getting there, and even on the hottest summer days it is a cool and tranquil place, carpeted in lush green and the soft colours of wild flowers, so that one almost expects Julie Andrews to appear, arms outspread, and begin singing. Half-a-dozen disparate items, plucked from the box of delights. Anyone finding them together in a box at an auction would consider them an odd assortment with no rhyme or reason, no obvious clues linking them together. Yet they speak to me, evoke memories, serve as small markers of my life, tell a little about who I am and what I think; so I shall take them out of their box and place them where I can see them, so that they, and the recollections which come crowding on me as I look at them, can live again.